Did the Kosovan Army Harvest Serbian Organs? Why Did I Leave the Jehovah's Witnesses? Paranormal Theories on "Shadow People"
By the time Demetrios had reached maturity and his father had died, the emperor Galerius Maximian had ascended the throne (305). Maximian, confident in Demetrios' education as well as his administrative and military abilities, appointed him to his father's position as proconsul of the Thessalonica district. The main tasks of this young commander were to defend the city from barbarians and to eradicate Christianity. The emperor's policy regarding Christians was expressed simply, "Put to death anyone who calls on the name of Christ." The emperor did not suspect that by appointing Demetrius he had provided a way for him to lead many people to Christ. Accepting the appointment, Demetrios returned to Thessalonica and immediately confessed and glorified our Lord Jesus Christ. Instead of persecuting and executing Christians, he began to teach the Christian Faith openly to the inhabitants of the city and to overthrow pagan customs and idolatry. The compiler of his Life, St Simeon Metaphrastes (November 9), says that because of his teaching zeal he became "a second Apostle Paul" for Thessalonica, particularly since "the Apostle to the Gentiles" once founded at this city the first community of believers (1 Thess. and 2 Thess.). The Lord also destined St Demetrios to follow the holy Apostle Paul as a martyr. When Maximian learned that the newly-appointed proconsul was a Christian, and that he had converted many Roman subjects to Christianity, the rage of the emperor know no bounds. Returning from a campaign in the Black Sea region, the emperor decided to lead his army through Thessalonica, determined to massacre the Christians. Learning of this, St Demetrios ordered his faithful servant Lupus to distribute his wealth to the poor saying, "Distribute my earthly riches among them, for we shall seek heavenly riches for ourselves." He began to pray and fast, preparing himself for martyrdom. When the emperor came into the city, he summoned Demetrios, who boldly confessed himself a Christian and denounced the falsehood and futility of Roman polytheism. Maximian gave orders to lock up the confessor in prison. An angel appeared to him, comforting and encouraging him. Meanwhile the emperor amused himself by staging games in the circus. His champion was a German by the name of Lyaeos. He challenged Christians to wrestle with him on a platform built over the upturned spears of the victorious soldiers. A brave Christian named Nestor went to the prison to his advisor Demetrios and requested a blessing to fight the barbarian. With the blessing and prayers of Demetrius, Nestor prevailed over the fierce German and hurled him from the platform onto the spears of the soldiers, just as the murderous pagan would have done with the Christian. The enraged commander ordered the execution of the holy Martyr Nestor (October 27) and sent a guard to the prison to kill St Demetrios. At dawn on October 26, 306 soldiers appeared in the saint's underground prison and ran him through with lances. His faithful servant, St Lupus, gathered up the blood-soaked garment of St Demetrios, and he took the imperial ring from his finger, a symbol of his high status, and dipped it in the blood. With the ring and other holy things sanctified by the blood of St Demetrios, St Lupus began to heal the infirm. The emperor issued orders to arrest and kill him. 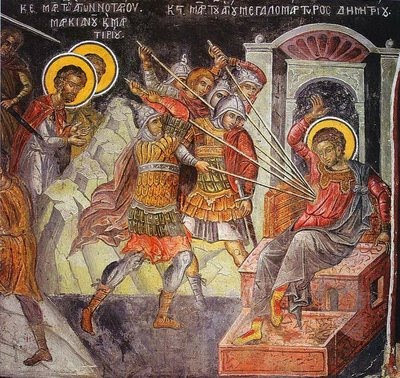 The body of the holy Great Martyr Demetrios was cast out for wild animals to devour, but the Christians took it and secretly buried it in the earth. During the reign of St Constantine (306-337), a church was built over the grave of St Demetrios. A hundred years later, during the construction of a majestic new church on the old spot, the incorrupt relics of the holy martyr were uncovered. Since the seventh century a miraculous flow of fragrant myrrh has been found beneath the crypt of the Great Martyr Demetrios, so he is called "the Myrrh-gusher." Several times, those venerating the holy wonderworker tried to bring his holy relics, or a part of them, to Constantinople. 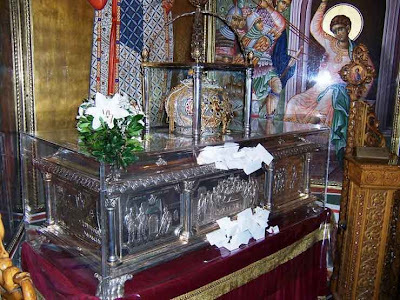 Invariably, St Demetrios made it clear that he would not permit anyone to remove even a portion of his relics. It is interesting that among the barbarians threatening the Romans, Slavs occupied an important place, in particular those settling upon the Thessalonian peninsula. Some even believe that the parents of St Demetrios were of Slavic descent. While advancing towards the city, pagan Slavs were repeatedly turned away by the apparition of a threatening radiant youth, going around on the walls and inspiring terror in the enemy soldiers. Perhaps this is why the name of St Demetrios was particularly venerated among the Slavic nations after they were enlightened by the Gospel. On the other hand, the Greeks dismiss the notion of St Demetrios being a Slavic saint. The very first pages of the Russian Primary Chronicle, as foreordained by God, is bound up with the name of the holy Great Martyr Demetrios of Thessalonica. The Chronicle relates that when Oleg the Wise threatened the Greeks at Constantinople (907), the Greeks became terrified and said, "This is not Oleg, but rather St Demetrios sent upon us from God." Russian soldiers always believed that they were under the special protection of the holy Great Martyr Demetrios. Moreover, in the old Russian barracks the Great Martyr Demetrios was always depicted as Russian. Thus this image entered the soul of the Russian nation. Church veneration of the holy Great Martyr Demetrios in Russia began shortly after the Baptism of Rus. Towards the beginning of the 1070s the Dimitriev monastery at Kiev, known afterwards as the Mikhailov-Zlatoverkh monastery, was founded, The monastery was built by the son of Yaroslav the Wise, Great Prince Izyaslav, Demetrios in Baptism (+ 1078). The mosaic icon of St Demetrios of Thessalonica from the cathedral of the Dimitriev monastery has been preserved up to the present day, and is in the Tretiakov gallery. In the years 1194-1197 the Great Prince of Vladimir, Vsevolod III the Great-Nest (Demetrius in Baptism) "built at his court a beautiful church of the holy martyr Demetrios, and adorned it wondrously with icons and frescoes." The Dimitriev cathedral also reveals the embellishment of ancient Vladimir. The wonderworking icon of St Demetrios of Thessalonica from the cathedral iconostas is located even now in Moscow, at the Tretiakov gallery. It was painted on a piece of wood from the grave of the holy Great Martyr Demetrios, brought from Thessalonica to Vladimir in 1197. The family of St Alexander Nevsky (November 23 also venerated St Demetrios. 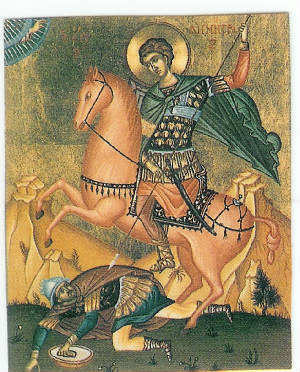 St Alexander named his eldest son in honor of the holy Great Martyr. His younger son, Prince Daniel of Moscow (March 4), built a temple dedicated to the holy Great Martyr Demetrios in the 1280s. This was the first stone church in the Moscow Kremlin. Later in 1326, under Ivan Kalita, it was taken down and the Dormition cathedral was built in its place. The memory of St Demetrios of Thessalonica is historically associated in Rus with the military, patriotism and the defense of the country. This is apparent by the saint's depiction on icons as a soldier in plumed armor, with a spear and sword in hand. There is a scroll (in later depictions) on which is written the prayer of St Demetrios for the salvation of the people of Thessalonica, "Lord, do not permit the city or the people perish. If You save the city and the people, I shall be saved with them. If they perish, I also perish with them." "He [Great Prince Demetrios] worried much about the churches of God, and he held the territory of the Russian land by his bravery: he conquered many enemies who had risen against us, and he protected his glorious city Moscow with wondrous walls. ...The land of Russia prospered during the years of his reign." From the time of the building of the white-walled Kremlin (1366) by Great Prince Demetrios, Moscow was called "White-Stoned." By the prayers of his Heavenly patron, the holy warrior Demetrios of Thessalonica, Great Prince Demetrios, in addition to his brilliant military victories, also gained the further prominence of Russia. He repelled the onslaught of the Lithuanian armies of Olgerd (1368, 1373), he routed the Tatar army of Begich at the River Vozha (1378), and he smashed the military might of all the Golden Horde at the Battle of Kulikovo Field on September 8, 1380 (the Feast of the Nativity of the Most Holy Theotokos), set between the Rivers Don and Nepryadva. The Battle of Kulikovo, for which the nation calls him Demetrios of the Don, became the first Russian national deed, rallying the spiritual power of the Russian nation around Moscow. The "Zadonschina," an inspiring historic poem written by the priest Sophronius of Ryazem (1381) is devoted to this event. Prince Demetrios of the Don was greatly devoted to the holy Great Martyr Demetrios. In 1380, on the eve of the Battle of Kulikovo, he solemnly transferred from Vladimir to Moscow the most holy object in the Vladimir Dimitriev cathedral: the icon of the Great Martyr Demetrios of Thessalonica, painted on a board from the grave of the saint. A chapel dedicated to the Great Martyr Demetrios was built at Moscow's Dormition Cathedral. The St Demetrios Memorial Saturday was established for churchwide remembrance of the soldiers who fell in the Battle of Kulidovo. This memorial service was held for the first time at the Trinity-St Sergius monastery on October 20, 1380 by St Sergius of Radonezh, in the presence of Great Prince Demetrios of the Don. It is an annual remembrance of the heroes of the Battle of Kulikovo, among whom are the schemamonks Alexander (Peresvet) and Andrew (Oslyab).